have you heard of this? 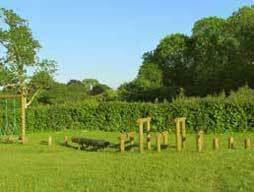 It is a brilliant and very easy way to support Piddlehinton Millennium Green. If you shop on line, certain of the popular sites -like Amazon, eBay, M&S and others, give a percentage of your payment to a nominated charity through The Giving Machine. Already we are raising funds in this way but there is scope for SO much more money to be raised if you would join in. It is very easy and costs you nothing (and can even be Gift Aided, increasing the value of your contribution) - so please go to www.thegivingmachine.co.uk to find out more. As I write this edition of News from the Green already there are signs of Springtime coming, we have seen beautiful snowdrops, buds on the trees and daffodils beginning to poke through. To some this may start thoughts of spring cleaning in homes but the Trustees are having different thoughts of Spring Greening! We will be on the Green between 10:00 a.m. and 12:00 on Sunday 24 March and would love to see you come along with secateurs, shears and rakes to give the Green a tidy up and cut back as we welcome Springtime (free refreshments for your labours). Just a reminder for the Evening with John Pilkington on Friday 15 March - 7:30 p.m. at Piddlehinton Village Hall where John will be telling us about his journey to Eritrea and Ethiopia. Both the Village Hall Committee and the Millennium Green Trustees will be welcoming John back and tickets are on sale now for £6 from either Susan Dredge - 01300348120, Cynthia Legg 01300348591 or any Trustee or Village Hall Committee member. There will also be a bar and raffle. Another event we will be holding is the ever popular Easter Egg Hunt & Coffee Morning on Saturday 20 April - 10:00 a.m. - 12:00 in Piddlehinton Village Hall. Go on the Easter Egg Hunt and then back for drinks and cake - or just come for the drinks, cake and a chat. Looking forward to welcoming you. Finally, many of you are already Friends of The Green and we are really grateful for your donations and support. For those not familiar with the scheme, a minimum of £5 per person per annum entitles you to become a FRoG and support your Millennium Green. Please contact me if you would like details of the scheme. Cheques can be made payable to Piddlehinton Millennium Green Trust and we would be grateful if you can Gift Aid your donation. Welcome to the first News from the Green for 2019 and the Trustees wish you all a very good 2019 and look forward to welcoming you onto the Millennium Green throughout the year for fun, relaxation and events. The first exciting news is that we will be joining forces with our friends from the Village Hall Committee to welcome back the very popular John Pilkington, a regular visitor to the valley, and renowned travel writer and regular broadcaster on Radio 4, to regale us with his latest travels (www.pilk.net/biography.html) The evening will be Friday 15 March - 7:30 p.m. at Piddlehinton Village Hall where John will be telling us about his journey to Eritrea and Ethiopia: Retracing a Victorian expedition. More details on the poster in the January issue of News &: Views and in the Events Calendar of this website. We are putting out a plea for a 'green-fingered' volunteer who could help us manage the living willow we have on the Green, with help from Trustees and other volunteers. We need someone who could organise working parties on an occasional but regular basis to work on keeping 'The Dragon' tamed through weaving and trimming. Please do get in touch - your help would be really appreciated. Many of you are already Friends of The Green and we are really grateful for your donations. September saw the time for "renewing the friendship". For those not familiar with the scheme, a minimum of £5 per person per annum entitles you to become a FRoG and support your Millennium Green. Please contact me if you would like details of the scheme and also to renew your friendship. Cheques can be made payable to Piddlehinton Millennium Green Trust and we would be grateful if you can Gift Aid your donation. If you feel there is some way you can help as a volunteer on The Green by way of helping with upkeep (eg annual river clean), or helping with/organising fundraising events, please come forward and speak to myself or any of the Trustees (details of Trustees on Village notice board, the Millennium Green notice board and on this website). You can also follow us on Facebook by sending a friend request to Piddlehinton Millennium Green. Susan Dredge - Chair, for Trustees of Piddlehinton Millennium Green. (01300 348120 or email: pidval22@live.com). All too soon the time has come to write the final chapter of The Millennium Green for 2018 and what a challenging and eventful year it has proved to be. I must start though by thanking, most sincerely, our eight Volunteer Trustees who have worked tirelessly throughout the year to maintain and take forward our lovely Millennium Green enjoyed by so many, and especially to Sue Hennessy who led the new equipment project and was instrumental in obtaining the funds needed. We have had extremes of weather which really disrupted the mowing programme and so thanks to Nick and Barry of Greendayz for all their efforts in keeping the Green mowed during the season through rain, snow and a heatwave. During this time the project to install the new play equipment took place and was completed in time for the start of the school summer holidays. Thanks go to Phil Ralph and son James from Plush for all their hard work in ensuring that the site for the new equipment was cleared and levelled in readiness and also to Jane Lovelace for allowing various contractors through her field to access the Green and who supports the Green on an annual basis helping with hedge cutting. It really was a great team effort. Maintenance does not altogether stop and on Sunday 18 November - 10:00 - 12:00 we would be grateful for any help with the Annual River Clean. Please wear wellingtons and come with gloves and a rake. Your reward for your efforts will be Cake and Coffee/Tea. Quiz & Puddings + Bar + Annual General Meeting (short!) - Friday 2 November - 7:30 p.m. in Piddlehinton Village Hall - Tickets £6 from Susan 01300 348120 or Rebecca 01300 348406. Christmas Sale - Saturday 8 December - 10:00 a.m. - 12:30 p.m. - Piddlehinton Village Hall (see poster in the November News & Views for more details). Look forward to seeing you. Friday 15 March 2019 - John Pilkington returns to Piddlehinton with a talk on his latest travels - more details to follow. With the Christmas season approaching and possible shopping online, there is an additional way of supporting the Green, at no cost to yourself, by going via The Giving Machine (www.thegivingmachine.co.uk and selecting Piddlehinton Millennium Green as your chosen charity to donate to). Go into the website, select the shop you wish to buy from and start shopping. If you feel there is some way you can help as a volunteer on The Green by way of helping with upkeep (eg annual river clean), or helping with/organising fundraising events, please come forward and speak to myself or any of the Trustees (details of Trustees on Village notice board/Millennium Green notice board and this website). You can also follow us on Facebook by sending a friend request to Piddlehinton Millennium Green. Finally, may I take this opportunity on behalf of all The Trustees, to thank you for all your support during 2018 and to wish you a good Christmas Season and a Happy, Healthy and Peaceful 2019. News from the Green - September 2018 - Play equipment. With great pleasure we report that fundraising for the new play equipment has finished – we have reached the target! Installation of the new play equipment is complete and it is being well used. As promised, below is a summary of how the money was raised. The amount raised slightly exceeded the target of £23,883.20. This turned out to be very good news as some additional expenditure was incurred by using a local contractor to level the site prior to installation of the new equipment. Warmest thanks to everyone who helped to achieve this goal – on time and just about on budget!! A donation of £600 from Piddlehinton Fete has come as an extremely welcome piece of help in what has been a year of significant expenditure on the Millennium Green. The Fete has been giving donations to the Green for a number of years and always they have been much appreciated. This year more than ever! Thank you to the Fete Committee and all who supported this important village event. News from the Green - July 2018 - Play equipment. 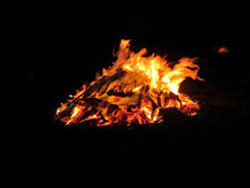 Welcome to the latest update of what has been happening on Piddlehinton Millennium Green. It has been a very busy and challenging first half of 2018 for the Trustees with fundraising and sourcing funding for the new play equipment (more of that later). The other challenge, particularly for our very diligent mowing contractor Nick Holt, has been the state of the ground and the growth of the grass (and weeds and nettles!!). In early March this year Nick made the first cut of the year on the Green at the beginning of the three weekly mowing programmes. What then followed was heavy snowfall, followed by several weeks of heavy rain. This meant that the water table was very high, the river flooded, the run-off from the adjacent fields together with the natural springs, also in the fields, broke which culminated in high water levels on already water sodden ground on the Millennium Green flooding 60% of the Green to several inches in depth. Nick visited the site over the following 6-8 weeks but due to the levels of water on the Green he obviously could not get his mowing equipment onto the Green let alone do any mowing and it took to the middle of May before the Green had drained and begun to dry out. I am pleased to report that at the time of writing (7 June) Nick had finally been able to cut the grass and recommence the normal mowing programme. Annual Rounders Match - Sunday 16 September at 2:00 p.m.
Christmas Sale - Saturday 8 December - 10:00 a.m. - 1:00 p.m. - Piddlehinton Village Hall. A further way of helping to raise funds, if you shop online, is via The Giving Machine (and select Piddlehinton Millennium Green as your chosen charity). Details of how to (easily) give whilst you are shopping can be found at www.thegivingmachine.co.uk. If you feel there is some way you can help as a volunteer on the Green by way of helping with upkeep (eg annual river clean), or helping/organising fundraising events, please come forward and speak to myself or any of the Trustees (details of Trustees on village notice board/Millennium Green notice board and this website). Finally, can I just remind dog owners please that dogs are not permitted on the Green but there is a tying up area just outside by the gate and we have cleared the hedge so that dogs and their owners can see one another. Susan Dredge – Chair For Trustees of Piddlehinton Millennium Green (01300 348120). Welcome to the first edition of News from Piddlehinton Millennium Green for 2018. We have a very busy but hopefully exciting year ahead of us. In previous News from the Green we announced that the existing wooden play equipment would need to be replaced during 2018. Having identified companies and got quotations for new equipment, the Trustees selected Allplay Ltd - a company that has some of its roots in Dorset. The total cost for supply and installation will be £23,883.20. Some very good news is that the application we made in November to the National Lottery Awards for All Fund was successful and we already have in the bank £9,372 we were granted. Further grant applications have been made, and there can be real optimism that a number of them will be successful too. The majority of the project cost will come from grant giving trusts. These trusts do like to have evidence that the local community is supporting the project and so it is planned to hold a dedicated fundraising event to boost funds. This is to be held on FRIDAY 20 APRIL at Piddle Valley First School. STOMPIN' DAVE, who gave us such a fantastic night a few years ago is coming to perform. He is very talented and his repertoire is wide - Blue Grass, Rock n Roll, Folk, Country and Blues. A hot supper of Ragu of Beef will be served and of course, a Bar. Tickets on sale for £10. When it is completed - we hope in June/July 2018 - there will be a set of strong, safe play equipment (and we have learnt an important lesson because these timbers will be set into "steel boots" to avoid the damaging effects of ground water) which our children, grandchildren and all others visiting will enjoy in the safe environment of our Millennium Green. We also have to remember that besides raising the money for this specific project, the Trustees still have to consider the general maintenance, upkeep and insurance of the Green (around £2000 per annum). As a self-funded registered charity we are reliant on support and donations for these monies. With this in mind we have our annual EASTER EGG HUNT & COFFEE MORNING - SATURDAY 31 MARCH, 10:00-12:00 AT PIDDLEHINTON VILLAGE HALL (see poster in the events section of this website). We are very grateful that many of you will have supported the Green by way of the Friends of the Green (FRoGs) Scheme whereby annual donations are made (minimum of £5 per person) but we are always looking to grow our band of FRoGs and Volunteers. Donations can be sent to me at 22 Paynes Close, Piddlehinton, DT2 7TF (cheques made payable to Piddlehinton Millennium Green Trust) or handed to any Trustee. If you are able to Gift Aid your donation, you can download a form at www.gov.uk and select Gift Aid single donation or contact me and I will get a form to you. If you feel there is some way you can help as a volunteer on the Green by way of helping with upkeep (eg annual river clean), or helping/organising fundraising events, please come forward and speak to myself or any of the Trustees (details of Trustees on village notice board/Green notice board). We do have a Facebook page to keep you up to date on what is happening on the Green so type in 'Piddlehinton Millennium Green' and request to join. Susan Dredge - Chair For Trustees of Piddlehinton Millennium Green. (01300 348120). Users of the Green will have noticed that the Dragon seems to have undergone a very drastic pruning and looks very sad. This is a short-term situation. It was becoming too large and difficult to maintain, so after taking advice, it has been trimmed down to close to ground with the expectation that a mass of new, soft, growth will spring forth and can be woven into a new, smaller, Dragon. I'm sure it will be worth the wait. 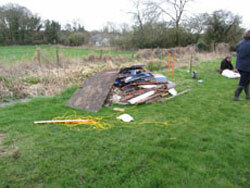 A similar arrangement applies to one of the huts, the other was too far gone and has been cut down completely. I have to start this latest News with an apology!! In the last issue I omitted to say very grateful thanks to Paul Green for his support in letting his building and utilities be used to store and work on the new boat. Still on boat news, again an apology that I told you the new boat was a Cornish Yawl where it is of course a Devon Yawl. The boat has been named and is now 'Piddle Pirate'. We took the opportunity to reveal the name of the boat at the Annual Rounders event. We received 29 suggestions from the Community and Friends of The Green, they all having been given the opportunity to participate via News and Views, a door drop, Facebook and email. The Trustees each picked their top three names from the suggestions submitted and the name with the most votes won (Trustees voted not knowing who had submitted which names). Well done Judy Steven on your winning submission. More work has been done in selecting a supplier for the proposed new play equipment. The Trustees have now decided on the company to give the contract to. The very good news is that the cost will be considerably less than originally thought. Work will now commence on making applications to grant giving trusts with the aim of meeting most of the cost from these organisations. 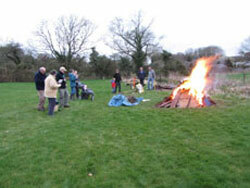 Sunday 19 November from 10:00 - The living willow 'Dragon' is in need of cutting and weaving. Please bring gloves, secateurs and shears. Any help appreciated. Refreshments provided. Saturday 9 December - Annual Christmas Fair at Piddlehinton Village Hall - 10:00-12:30pm. See poster . Donations of cakes, preserves and raffle prizes would be very welcome. Please contact Susan (01300 348120) or Honor (01300 348252) or speak to any Trustee. Sunday 23 September saw what has now become a traditional Millennium Green Annual Rounders event. Many thanks to everyone who braved the weather and luckily rain did not stop play. There was a really good turn out and wonderful to have so many players (33 in all). Josh Collins was presented with the winner's cup by Pat Hansford a long term resident of Piddlehinton. Congratulations to his team on their win. Not only was it a great afternoon of rounders, the event raised £123 for The Green funds with tea and cakes being enjoyed. Also it was so good to see lots of new faces there and to see the next generation of players coming through. We are very grateful that many of you will have supported the Green by way of the Friends of the Green (FRoGs) Scheme whereby annual donations are made (minimum of £5 per person). September sees the time for renewal of your Friends membership. If you have not set up a Standing Order and would like to renew your Friendship for another year, donations can be sent to me at 22 Paynes Close, Piddlehinton, DT2 7TF (cheques made payable to Piddlehinton Millennium Green Trust) or handed to any Trustee. If you are able to Gift Aid your donation, you can download a form at www.gov.uk and select Gift Aid single donation or contact me and I will get a form to you. We are seeking one or two people who would consider becoming a Trustee of the Green. Please speak to any Trustee to find out more information and what being a Trustee entails. Contact details of Trustees are here. We hope that you have all had a good summer and enjoyed holidays either at home or beyond. By the time you read this latest news we hope as well that you will have been down to the Green and seen and enjoyed the new boat which has been installed, very different to our old Millennium Belle. We have to say a very big thanks to Rob Murphy of Blue Lias Marine who gave us hours of his time to do the work which was needed to make this Cornish Yawl suitable as our new play boat. Thanks also must go to two of our Trustees, Alan Phillips and Martin Hawkins who also put a lot of their time and effort in and made arrangements, with Rob, to get the boat installed in its new home. We really hope that there will be many years of enjoyment using the boat. Hopefully you have seen the competition which has been running to find a name for the new boat and the winner will be announced at the Annual Millennium Green Rounders event (see below). Annual Millennium Green Rounders, come and play, come and watch - a lovely family event (more details on the poster in this issue of News & Views). Refreshments will be available. Donations of cakes on the day would be appreciated. Also the new name for the boat will be announced along with the person who chose the name. 'Sounds of Old Dorset' presented by New Hardy Players and Williams Barnes Society - music, readings and Hardy play excerpts. Tickets £8 to include cheese platter supper and there will be a bar available. Again more details on the poster within News & Views. Annual Christmas Fair at Piddlehinton Village Hall - 10:00 - 1:00 p.m. More details in next News from The Green and November/December News & Views. We are grateful to everyone who contributed their ideas on what we should include when we replace the now aging Play Castle next year. As a result of this we shall have swings, including a basket swing, a slide and a rope climbing structure as well as a basketball net and board. We are obtaining quotations with a view to deciding which company can provide what we want at the most competitive price. When this is decided, fundraising can begin in earnest! As prices have increased significantly since we commissioned the Play Castle in 2002, it appears that we are looking in the region of £30,000, most of which we hope will be raised through applications to grant giving trusts. Finally, to end this edition we are seeking one or two people who would consider becoming a Trustee of the Green. Even if you are thinking about it, please take a step forward to speak to one of the existing Trustees to find out more information. Contact details of Trustees are either on the notice board by the Green or on the village hall notice board or the Trustees page of this website. Welcome to the second update from the Green. Unfortunately, this piece has to be started with news that we have had more damage done on the Green with graffiti, broken notice board and wood to be used for the new boat being thrown in the river. The Police have been informed and our local community Police Officer has been very diligent in visiting the Green and spoken with one of the Trustees. We would ask everyone please to keep eyes and ears open and if you do see anything to ring the Police on 111 or 999 if you see actual vandalism taking place and please let a Trustee know. Now, onto more positive news. Work is progressing well on preparing the new boat thanks to Rob Murphy of Blue Lias Marine and you can find out more details and see a picture on our Facebook page. We will be organising a competition to "Name the New Boat", watch this space and the Piddlehinton Millennium Green Facebook page for more details. Sunday 24 September for the Annual Millennium Green Rounders event, come and play, come and watch - a lovely family event. More details to follow. Friday 20 October - AGM and An Evening of Entertainment, again more details to follow. We know everyone visiting the Green has enjoyed the large fort play structure and this has served us very well but it is going to need replacing within the next 12 months and so plans have been set in motion, taking into account the responses from the recent survey which was done, to get quotations for suitable play structures. Funding is being sought but also there will have to be fundraising events locally to raise what will be a substantial amount to be able to provide a replacement play area. All donations, offers of putting on events and help of any kind will be gratefully received - speak to one of your Trustees. Everyone is free to use the Green for personal events but there are guidelines and we would ask, if you wish to have your party or other event on the Green, that you contact one of the Trustees in the first instance to ensure there is not a clash. Also as it is classified as an 'Open Space' for use by all you cannot 'book' the Green exclusively for personal use. Please contact any of the Trustees if you feel able to help in any way or if you would like to find out more about becoming a Trustee. Contact details for Trustees can befound on the notice boards by the Green or at Piddlehinton Village Hall. Finally, you can keep up to date electronically here or by visiting our Facebook page "Piddlehinton Millennium Green" and becoming a Friend on Facebook. This is the first of what we hope will be regular updates with news and events from Piddlehinton Millennium Green. Many of you will know, and have used, the Millennium Belle boat. Sadly, after advice from our local boat builder, we realised that The Belle had reached the end of her safe and useful life and so she was burnt, on The Green, in March. However, the good news is that we have obtained a replacement boat, very different from The Belle. Work is being done to the new boat to make her suitable to go on The Green and we will let you all know when it is being installed. Winter hopefully is now behind us, no flooding so far this year, and so The Green has had its first 'haircut' of 2017 and The Dragon also has had some reweaving, topping off and is looking much smarter - do go down and visit. Along with Millennium Belle coming to the end of her life, the Trustees have acknowledged that the Fort play structure is also coming to the end of its time and will need replacing in the near future. A survey has recently been done (and thank you to those who responded) to canvas ideas for future play structures and equipment for The Green and this is being considered over the coming weeks and months. We know that very many people both within Piddlehinton, Piddle Valley and the wider community very much enjoy the open space which is Piddlehinton Millennium Green. However, what people may not appreciate is that The Green is cared for by an enthusiastic team of Trustees, together with volunteers, who also raise the £2,000 per annum needed for its upkeep. This money is raised by holding events and donations by Friends of the Green Scheme (FRoGS). This does not include any projects such as replacement of equipment due to wear and tear and, sadly, during last year, episodes of vandalism. Anyone who feels they may be able to help in any way, by fundraising/helping with events, donating and doing occasional maintenance work on The Green or by becoming a FRoG (Friends of The Green) - minimum donation £5 per annum per person would be most welcome. Contact details for Trustees can be found on the notice boards by The Green, at Piddlehinton Village Hall or on this website. Finally, you can keep up to date electronically by visiting our Facebook page "Piddlehinton Millennium Green" and becoming a Friend on Facebook. Regretfully we have to advise that there has been further vandalsim to the facilites provided on the Millennium Green at Piddlehinton. One of the notice boards on the entrance gate has been snapped off, graffiti has been sprayed on the interpretation boards by the river and one of the benches, and parts of the base for the (soon to be returned) "Millennium Belle 2" boat have been chucked into the river. It is distressing that these facilites, provided by the Community for their enjoyment and relaxation have been mistreated. March 2017 - The Trustees have re-woven the Dragon, using both some existing growth and planting new stems as necessary. He is looking much improved and is carrying out his duties, Guarding the Green, as always. One of the "huts" has been re-woven to see if it can be resurrected, the other has been cut down to near ground level to stimulate new growth and hopefully there will be enough to weave into a hut shape this autumn. 14 March 2017 - The Millennium Belle was given the promised "Viking Send-off" on Tuesday evening, toasted by the Trustees. Work is in hand to prepare her replacement, a new supporting base will be built shortly, with a view to a Launch Party in the early spring. January 1017 - The Trustees are pleased to report that a replacement for the "Millennium Belle" boat, which has performed sterling service on the Green for the last 15 years or so, has now been obtained. "Millennium Belle" was a retired Lifeboat Tender, kindly donated by the RNLI, and has given much fun to many over the years, but had unfortunately deteriorated beyond the point of further repair. "Millennium Belle" will be given a true Viking send-off in the near future, when conditions are suitable, and after a small amount of modification work, the new boat will be "launched" in the spring. Piddlehinton Millennium Green Trustees thank everyone who came to the Christmas Sale on 10 December to support, donate and raise funds for the ongoing upkeep of the Millennium Green in Piddlehinton. It was a busy morning and a very successful event, not only to raise funds for the Millennium Green - £404.65 was raised, but also as a very social community event. We would also like to thank you for all your support throughout 2016 and hope you have enjoyed using the beautiful space that is the Millennium Green. We look forward to keep you updated regularly with News from The Green with events and plans for 2017. Trustees: Alan Phillips (Chair until Oct 2016), Susan Dredge (Chair from Oct 2016), Linda Bellini (Secretary}, Rebecca Howard (Treasurer), Sue Hennessy, Claire Hudson, Honor Brown, Portia McBride, Mike Lines (stood down 2016), Martin Hawkins (Trustee from Sept 2016). Millennium Green organised fund-raising events: Christmas Fayre (Dec 2015), Race Night (Jan 2016), Easter egg Hunt (March 2016), John Pilkington Talk (March 2016, with village Hall Committee), Rounders on the Green (Sept 2016), AGM Quiz and Puddings (October 2016). Maintenance: New grass box built, BBQ brickwork repaired, vandalised swings and safety fences repaired, tree trimming undertaken to increase light around willow dragon. Hedge height alongside footpath reduced and access widened, River channel cleared in Autumn. Other Items: Face Book page created, Friends of the Green (FroGs) reinvigorated. Plans for the future: The Millennium Belle Boat to be replaced, funding drive requiredand community involvement sought to replace play structure. Refurbish the bird and bat boxes, Cut & lay scrub to improve light access over sheltered river area to increase bank vegetation and wildlife habitats and reduce bank erosion. There have been six fund-raising events this year, which have raised a total of £1988, which together with donations from Friends of the Green (FroGs) and the Fete of £355 have given us a healthy income. The annual running costs this year amounted to £1582 -this includes regular mowing, insurance and any additional maintenance and vandalism repairs. Trustees: Alan Phillips (Chair, 01300 348 220), linda Bellini (Secretary), Rebecca Howard (Treasurer), Honor Brown, Susan Dredge, Sue Hennessy, Claire Hudson, Mike Lines, Portia McBride. 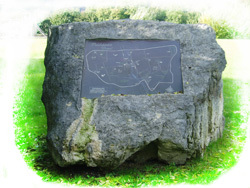 The Millennium Green is open to all, visitors and inhabitants, and the trustees are tasked with maintaining it as a haven of natural beauty and a place for recreation and relaxation. Thanks are given to all the trustees for their hard work and dedication to the care of the Green. Without them the Green would not exist. If anyone would like to become a trustee and help with the Green please just get in touch with Alan Philips or any other trustee. To raise funds we held the following events - the Xmas Fayre, the Easter Egg hunt, and Rounders on the Green. Costa del Piddle Paella Night was a great occasion, and thanks are extended to Sue Hennessy for letting us use her garden. The film night showing Grease was also a great success. Perhaps the greatest success of the year was raising lottery funds, equally matched by our own funds (both raised and donated), to allow us to purchase and install a magnificent tree trunk see-saw and some additional trim trail apparatus. We also gratefully received donations from the Piddlehinton Fete, and a group of local mothers who gave us proceeds from a children's disco. We have provided new tables, refurbished benches, renewed the wood chippings around the play castle, given the willow dragon a much needed trim, and replaced the information board housings. It has also been lovely to see many people enjoying the Green, having BBQ's, children's birthday parties, or just enjoying a paddle in the Piddle. The Village Hall duck race was held on the Green this year, and we hope it will be an annual event. River clearance on the Green next Sunday 18th October from 10.00-12.00: we are looking for volunteers to come and help, coffee and cakes provided, just bring a smile, some gloves, wellies and tools if you have them! Xmas Fayre will be on 5th December (l0:00-12:00) in the Village Hall, crafts, cakes, preserves, stalls. Race Night on January 15th, by popular demand. Fun for all. John Pilkington will be back on 18th March walking adventures in the Ukraine. 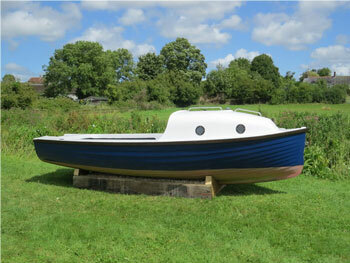 Finally a key task and priority for us in the coming year is to refurbish the Millennium Green life boat. It is suffering from exposure to the elements, but with TLC and, we hope, expert boat-building help, we will get it in good order. There have been six fund-raising events this year, which have raised a total of £1635, which together with donations of £1713 have given us a healthy income. We also received a Lottery Grant of £1833 - 50% of the cost of the new see-saw and trim trail. Two major items of expenditure were two replacement tables and the new play equipment, together totalling £4728. The annual running costs this year amounted to £2219 - this includes regular mowing, insurance and any additional maintenance. Included in the maintenance costs this year is £307 for a load of chippings for the play structure. The insurance has increased slightly, to reflect the new play equipment. We had a great evening on 6 June, enjoying delicious paella, freshly prepared on the spot by Quiddles of Portland, in Sue Hennessy's lovely garden. This time the English weather, whilst not quite Costa-like, was kind to us, unlike the downpour we had to survive in 2011! Thank you Sue for your generosity in letting us use your garden once again. Thank you also to everyone who came along and supported the Green - we raised just over £600. All the proceeds go towards keeping the Green looking neat and tidy, maintaining & improving the facilities, and ensuring it is safe for all to use - the annual running costs are around £1200, all met through our local fundraising. Don't forget to try the new see-saw and trim trail items! Our next event is Rounders on the Green on Sunday 13 September - bring a team, or just come along and join in an existing team, all welcome. During the early summer, the dragon has been given a "hair cut" and been re-woven (it really needs doing several times a year) and is back to his fierce old self. The Trustees have also had to replace both the wooden picnic tables, which unfortunately were rotting and becoming unsafe. It is a great shame that the Oak did not last as long as was hoped and the decision had to be made to replace them with treated softwood. Several of the bench seats have suffered the same fate, but sterling work by John Hudson and Alan Phillips have repaired and replaced these and Alan has also made some new small seats out of the salvaged oak from the picnic benches. After much deliberation, it was agreed that a see-saw would be provided for the enjoyment of the younger (and young at heart) visitors, and a splendid rustic beam is now in place, along with a new "trim-trail" to replace the "caterpillar" and the speaking tubes, both of which had reachd the end of their life. Many thanks to everyone who supported this event with their generous contributions of produce or prizes, and to those who just came and spent their money! We raised a splendid £287.00. All our fundraising goes towards essential maintenance and repairs to keep our Green safe and tidy for all to use. Thank you! The Trustees took a very hard look at what needed to be repaired and replaced on the Green. Some of the play equipment was showing signs of age and, after a succession of wet years, the hedge bordering West Lane and the willow dragon were overgrown. These became the main priorities for 2012 - 2013. Some of the original wooden play items have been removed to make way for new equipment. Replacing the wooden play structures in time for next summer will be the focus of a special fundraising initiative during the winter. A grant was obtained from West Dorset District Council to meet half the costs of laying the hedge. Ivan Hicks, who designed and led the creation of the willow dragon back in 2001 was engaged to advise and lead volunteers to prune and restyle the structure. It was very pleasing that children from classes 2, 3 and 4 of Piddle Valley School had a significant involvement in the work. We are grateful to the Head Teacher and staff for supporting this work. Maintaining the Green so that it is a pleasant and safe place for all to enjoy is vital work. During the last financial year the grass has been mown regularly; the river has been cleared of vegetation; nettles and brambles regularly removed from play areas; the boat, barbecue and play castle all repaired; litter regularly cleared from the bin and the ground. Regular health and safety checks are undertaken and a full ROSPA assessment was commissioned and undertaken. A number of fundraising events were held during the year; thanks to the generosity of the Piddle Valley Garden Club and Susan Belgrave, a concert by Stompin' Dave was held in a marquee at West Lodge. This was followed by the Rounders Tournament on the Green. Proceeds from a talk given by John Pilkington were shared with the Village Hall. We held the annual Christmas Sale and and then Richard Kay generously gave his services as a speaker with a talk about Portraits of Monarchy. An Easter Egg Hunt and Tea and a Barn Dance in May completed a busy year of events. A number of generous donations boosted funds - from Piddlehinton Fete, Piddle Valley Parish Council and a private gift which was used to provide a new bench. Friends of the Green subscriptions helped as did proceeds from activities such as the Giving Machine and Suttons Seeds. The generosity of everyone who supported these events and initiatives has made it possible for the Trustees to reinvest in the Green by making repairs and replacements. Very sincere thanks to each and every one of you who has helped in these ways. Currently we have 10 Trustees. Sue Hennessy will stand down as Chairman at the AGM and this role will next be undertaken by Alan Phillips. Steve McCardell will stand down as Treasurer and this role will be undertaken by Rebecca Howard. Linda Bellini will continue as Secretary. Portia McBride will take over as Friends of the Green Membership Secretary. The other Trustees are; Julian Wardlaw, Honor Brown, Claire Hudson, Mike Lines. We would be more than happy to hear from anyone who would be interested to find out more about joining this group - fresh ideas and enthusiasm are warmly welcomed! Vehicles on West Lane - regrettably there are still people who take their vehicles down West Lane to access the Millennium Green. Only people with disabilities should use vehicles to access the Green via West Lane. Trustees have on a number of occasions over the years spoken with drivers to explain why they should not take cars along West Lane. Additionally this year we have replaced the notice at the end of the lane advising this fact. Hopefully people will take heed. Dogs - similarly, it is frustrating that there are some who allow their dogs on the Green causing nuisance and health risk to children who should be able to play freely there without risk of dog mess. We appeal for your understanding and co-operation. Litter - the amount and type (some quite foul) of litter left in the bin is very challenging to the volunteers who have to empty it. Additionally the new recycling regulations make it difficult to process what is left in the bin. So we have removed the bin with the intention of promoting a "TAKE HOME" policy. Sunday 27 October 10.00-12.00 Annual river clearance working party. Please come and help with this essential task. It is good fun for all ages! Bring wellies, gloves, spades, loppers etc. Coffee and biscuits guaranteed. Saturday 7 December 10.00-12.00 Christmas Sale in Piddlehinton Village Hall. Home made cakes, sweets, pies and preserves. Craft stalls and 2 special Christmas raffles. We greatly need and welcome gifts of homemade produce for this sale please. The Weather! -like the rest of the Valley, the Green has been "under the weather" with water covering large areas of grass for many weeks. It is now receding but do take your wellies if you're going down to the Green. The grass needs cutting but we have to wait for it to dry out before we can begin. our handsome Willow dragon has recently been showing signs of age, which is not surprising as it is now 12 years old. So to restore this popular natural play structure to its former glory, Ivan Hicks, who designed and led the original construction, will be working on the dragon during March. Children from years 2,3 and 4 at Piddle Valley School will be helping Ivan -what a great way to involve them in our community! You are very welcome to go and watch ...and maybe lend a hand with a spot of willow weaving if you feel so inclined. Work is weather dependent so definite dates and times cannot be given. like the dragon, some other equipment is showing signs of age and so the time has come to say goodbye to some of the items which date back to when the Green was opened in 2000 and replace them with new ones. The Trustees are concerned to find good quality equipment that will fit in with the ambience of the Green and last for a good many years. So look out for new play items to enjoy this coming year. sadly, the decision has been made not to install a petanque court on the Green. This is because it proved impossible to find a sensible location for it -particularly one which would not be subject to flooding. It is disappointing as there was real support to have this recreational facility for our community, but regrettably, the Millennium Green is not the right place for it. a grant from West Dorset District Council has made it possible to lay the hedge which runs parallel to West Lane. 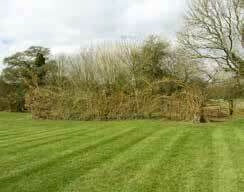 This will produce a stronger hedge and is part of the concern to manage the Green according to best practice. look out for a new tree recently planted on the Green. It is the one presented as a prize by Dorset Wildlife Trust for our entry in the Wildlife Garden of Dorset competition 2012.
following the success of last year's EASTER EGG HUNT AND AFTERNOON TEA -a lovely event with something for all members of the family -there is to be another this year on Easter Monday; 1 April. 2.00 -4.00pm in Piddlehinton Village Hall. Please do join in and we would very much welcome donations of cakes! The main fundraising event this year will be a BARN DANCE AND SUPPER to be held on Saturday 18 May at Charlton Down Village Hall (Herrison Hall). Music will be provided by the popular Dorset band JEROKA. This is sure to be a great evening with lots of fun and with delicious food and drink. Tickets will be available soon from Trustees for £10. THE ROUNDERS TOURNAMENT is another family event that we have been asked to repeat. This year it will be held on Sunday 15 September on the Green. Please put the date in your diary. did you know that we have a scheme which enable you to provide funds for maintaining the Green in a very easy way? For a minimum annual gift of just £5, you can join our much valued group -Friends of the Green. Please ask any of the Trustees for a form or contact The "Friends" Secretary - Portia McBride 01300 348294. She would also be pleased to hear from any existing Friends who want to pay their next subscription. have you heard of this? It is a brilliant and very easy way to support Piddlehinton Millennium Green. If you shop on line, certain of the popular sites -like Amazon, eBay, M&S and others, give a percentage of your payment to a nominated charity through The Giving Machine. Already we are raising funds in this way but there is scope for SO much more money to beraised if you would join in. It is very easy and costs you nothing -please go to www.thegivingmachine.co.uk to find out more. NO DOGS ON THE GREEN -this is to ensure that the Green is safe, clean and healthy for everyone to enjoy. Everyone's understanding of this as well as their cooperation is so important. ONLY VEHICLES CARRYING A DISABLED PASSENGER TO USE WEST LANE -the right of access for the general public along West Lane is restricted. You may walk or ride a horse along the lane and you may take a car if it is for disabled access to the Millennium Green. There is a parking space for this purpose adjacent to the entrance to the Green. Please be understanding of this legal limitation.